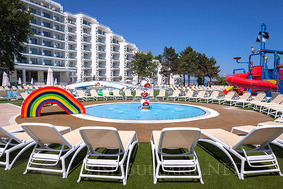 Location: Paradise Blue hotel and SPA is located in the center of Albena, 20 meters from the beach, on the main shopping street close to many restaurants and shops. Accommodation: The hotel offers 238 rooms and one-bedroom apartments located on 9 floors. 11 of the rooms have access to their own swimming pool and the other rooms overlook the sea or the park. The rooms offer flat-screen TVs, cable TV, safe, telephone, internet, minibar, air conditioning, coffee and tea set, bathroom with bathtub and shower, hairdryer, balcony. Bars and restaurants: A la carte and buffet restaurants offer dishes prepared with organic products. The hotel features bars and a nightclub. SPA center: SPA & Wellness Center offers a variety of SPA programs and procedures, indoor pool and gym, outdoor pool, children's pool with water attractions. Conference center: The hotel also has an equipped multifunctional hall with 500 seats, suitable for events such as seminars, company and incentive events, team buildings, evening parties and cocktails. Facilities: 24-hour front desk service, free internet, library, private beach with free umbrella and two sun loungers per room, underground parking, children's club and animation, room service, laundry and ironing, rent-a-car, Hairdresser, fitness, exchange office, massage salon, tennis courts. Free wireless internet is available in all hotel rooms and public areas.